A recent study published in the Journal of Minimally Invasive Gynecology reported safe improvements in reproduction after resection surgery to repair a septate uterus. Women in the study previously reported infertility and recurrent miscarriage. About 125 women with recurrent miscarriage or primary infertility were included in the study. All participants suffered from partial complete septate uterus or fundic septate uterus. Septate was repaired using metroplasty performed via hysteroscopy. Conclusion: After surgery, 78 women were able to achieve pregnancy resulting in 70 live births. First live births were reported in 53% of women with infertility. Thirteen pregnancies were achieved using assisted reproductive technology. Miscarriage rates dropped significantly after metroplasty in the affected population. Researchers claim metroplasty repair of the septate uterus significantly improved rate of first live birth and pregnancy while decrease the number of recurrent miscarriages in the participating population. 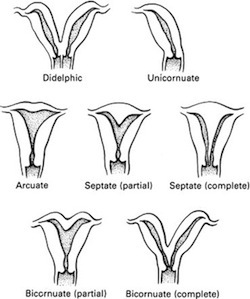 Bendifallah S, Faivre E, Legendre G, Deffieux X, Fernandez H. Metroplasty for AFS class V and VI Septate Uterus in Patients With Infertility or Miscarriage: Reproductive Outcomes Study. J Minim Invasive Gynecol. 2013 Jan 10. pii: S1553-4650(12)01313-1. doi: 10.1016/j.jmig.2012.11.002.